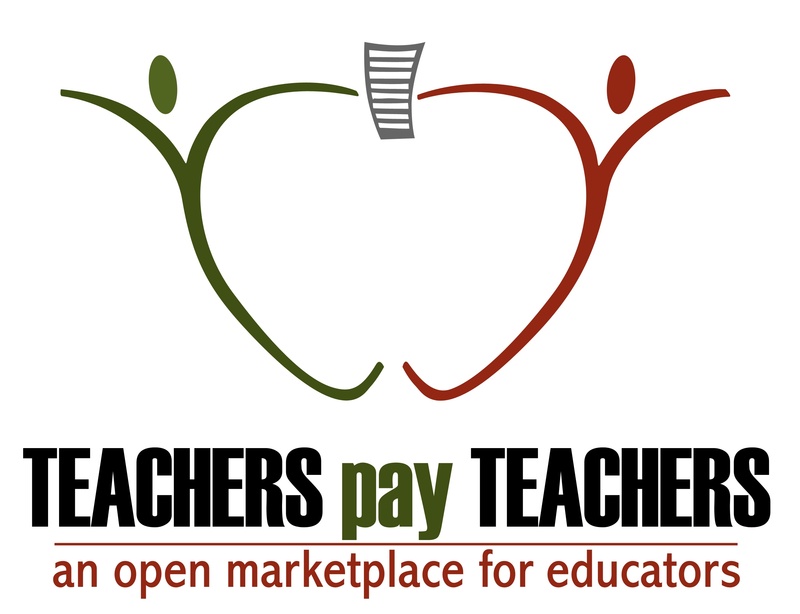 One of the largest online marketplace for teachers is Teachers Pay Teachers. If you haven’t heard of this store, you are either new to teaching or long since retired. This vibrant educator community hosts teacher-authors who wish to sell their original lessons and ideas to other teachers, homeschoolers, and unschoolers. Since its start in 2006 by a former teacher, it’s grown to over 3.4 million teachers buying or selling over 2.7 million education-oriented Pre-K through High School lesson plans, curricula, videos, classroom activities, assessments, books, bulletin board ideas, classroom decorations, interactive notebooks, task cards, Common Core resources, and more. 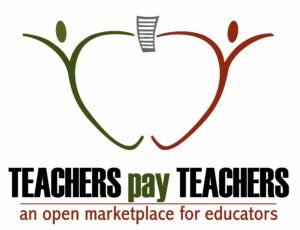 Teacher-authors have earned more than $330 million since TpT opened its doors with about a dozen making over $1 million dollars and nearly 300 earning more than $100,000. There’s no set-up charge, no cost to join, and no annual fee unless you choose to become what’s called a Premium seller. My general observations and To Do list from the conference can be found here (if the link doesn’t work, that means it’s not live yet. Check back later!). I didn’t want to overwhelm you-all by including my thoughts on the sessions I attended so I saved them for this post. 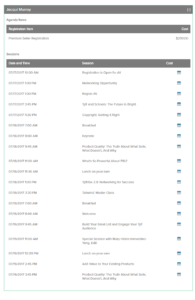 I start with a schedule of seminars for the three days (only those I attended). Then, I post my notes and screenshots from the sessions. These aren’t exhaustive by any means, just an idea of what was included. For the real thing, you’ll have to attend next year’s event! 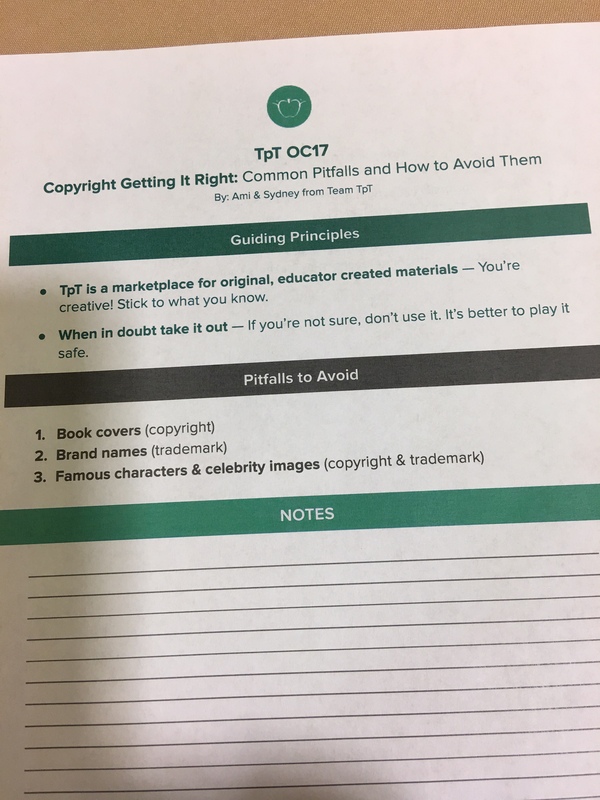 One of TpT’s attorneys talked about the importance of using only media that you have permission to use or created yourself. A rule of thumb: When in doubt take it out. When in doubt get permission. This is the Gold Standard of copyrights. Always default to this if you wonder what to do. Book covers: Get permission to use someone’s if you want to use it in your TpT products. 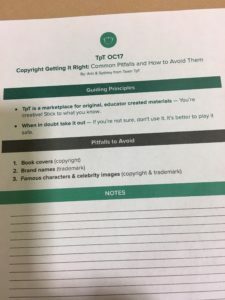 Exceptions to the need for permission: public domain and fair use (for educational use). Trademark infringement occurs when you use a brand name or logo in a way that could be misleading or confusing. Images of famous characters or celebrities probably are protected. The idea of this seminar was that followers want to know more about you, not just what you sell. The presenters offered a variety of ways to do that. Why use Instagram? It has 400 million active users. 51% use it daily. It’s a personal approach not matched by other social media. Post weekly to your social media with an image and a quick text. Instagram can be a mini blog. TpT offers a way to track the effectiveness of marketing campaigns using UTM codes. Honestly, I’m not there yet. I attended to get informed and left figuring I’d put this off for a few more months. Using Pinterest and Instagram to grow your sales. Pinterest had 780 million education pins last year. 75% of Pinterest users are on mobile. To be engaging, Pinterest pins should use high-quality images and text overlays. Be sure to brand each pin. Images should be vertical–2:3 or 1:3.5. Pexels is a good source for stock images. Great image editing online sites include Canva. Picmonkey. Befunky. Use pin description to inspire. Write something compelling, useful, and evergreen. Keep it under 300 characters. Instagram: Use it as a visual newsletter. You have to have more than 10,000 followers before you can include a link. No automatic posting to instagram. Only post 1-3 x/ day. How do you know the right time to revise old work? Does the cover and design appeal to 2017 teachers? Is the content still best practices? How much time would it take to revise? Does it sell currently–would revising make it sell better? What will you change and why? Brand it with your identity (i.e., logos, headers, colors, images). Put your logo on each product. Put copyright notice on each page. Use interactive emails to engage readers. Use video on Facebook, especially to introduce yourself. 100 million hours of video are watched on Facebook every day. 95% of Facebook videos are played without sound. Include text to explain what’s going on. In Facebook posts: Use relatable imagery, real life situations including your product. Or, show behind the scenes, what you do to prepare. Show how your product fills a need for your audience. Use Belive.tv to engage audience in Q&A. Resurface greatness: Find which of your Facebook images or posts had a good reach and repost it. That’s ok to do. The rule of 7: The audience needs to see something seven times before they take action. Do not rely on one platform. Schedule Facebook posts by creating the post. In the upper right corner of post, it’ll ask if you want to schedule it. Best marketing strategy for growing your audience is email lists. Use Lead pages for freebies to grow your email list. How can I ensure my work will stand the test of time? Does it get good feedback? 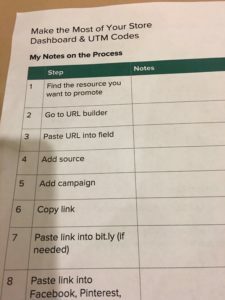 Email is the number one way the presenter increases his TPT store. It’s all about relationships. I heard this over and over. Send emails like you’d send a note to a friend. Make it friendly, not sales-y. [Those hated] Pop ups work well if they’re aligned with the blog post. Google dings you if they’re on mobile devices. Always highlight the benefit when making a pitch. Don’t apologize for asking for the sale. Don’t over-promise. Email open rate should be 30%. Click through rate should be 4%. Unsubscribe rate should be .2 to .5. Call to action should be on its own line. I found it interesting that the presenters emails don’t include pictures. The shorter the email, the better. All should be above the fold. Purge emails for people who haven’t opened an email in a long time. The term newsletter is old. Some people think they can sell whatever comes to mind. That’s not a good idea. Find a niche that needs to be filled. What do you dread teaching? That probably means there aren’t resources for it. You could create them. Ask people what they think of when they think of you. What are you the go to person for? What can the data tell you to support teacher author efforts? We have to prepare students for their future, not our past. Whoever planned this conference–get them a cape!